12 Game of Thrones Characters You See in Every School - Which One Are You? You have seen more staff, curriculums and policy changes than anyone else. You have been around the block and know how things should be done. You are respected and good at your job even though you're not part of the SLT. With the latest changes from the new regime (government,) you realise you are too proud to and honourable to subject the ones you love to this unnecessary and cruel rule of testing. Retirement is looming unless the new pressures get to you first. Although the core subjects of English, Maths and Science aren't your strong point, when it comes to a subject like PE, there is no one as passionate. 15+ Ideas for the Emoji Keyboard in the Classroom eBook! 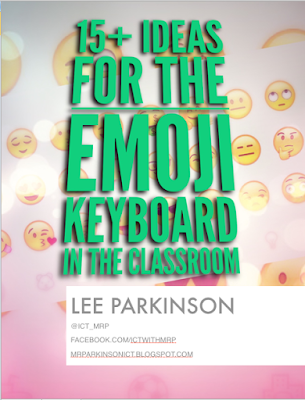 I am so proud to be releasing my latest eBook - 15+ ideas for the emoji keyboard in the classroom. The eBook shares over 15 ideas for primary school teachers to utilise the emoji keyboard to enhance learning in the classroom. With ideas for English and Maths, I am sure teachers with find the ideas both useful and inspring. At present, the eBook is only available on the iBooks store, it will be available to purchase as a PDF at a later date. You can buy a copy of the eBook for just £1.49 making every idea less than 10p... bargain 😉 ! If you do find the eBook useful, please take a minute to leave a review on the iBook store. It really helps get the eBook more exposure and I would really appreciate all the support. 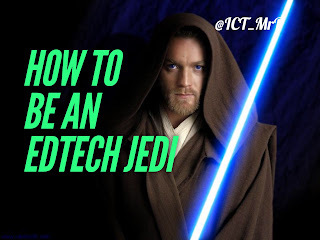 Are you an EdTech Jedi? Yesterday, I had the pleasure of presenting at the Hull and East Riding IT conference. In my keynote, I discussed what Star Wars can teach use about effective use of EdTech in the classroom. For teachers to make the most of technology in the classroom, they need to believe it can transform teaching and learning. This tends to happen once a teacher has seen how technology can help them as a teacher, how it can make their life easier by saving them time and improving their practice. One of the biggest problems in getting teachers to utilise technology is the fear that it might not work, it might not go to plan. Teachers need to stop focusing on what might go wrong and focus on what can go right! Thanks to all that came to the conference on Friday. This was the first conference of this type and I had a great day sharing ideas around the art of camouflage learning. This weekend, Lily was ecstatic to have Barnaby come and stay! I have previously blogged about how we used technology to help Harry recount his weekend. I also did the same when Charlie brought him home. So it would only be fair to let Lily use technology to retell her adventures in a way she can't yet do on paper. Today I delivered my joint conference with Alan Peat in the North East! 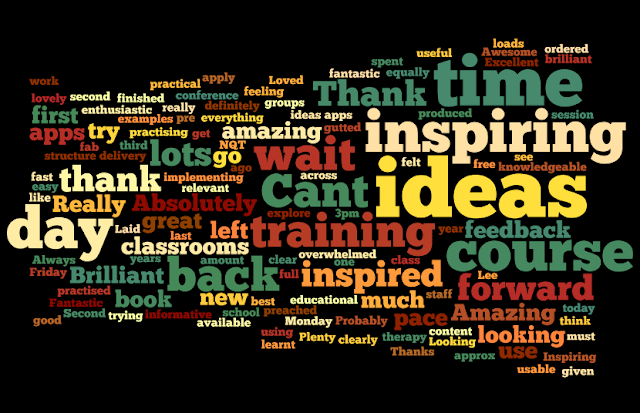 It was a brilliant day with a great group of enthusiastic and passionate teachers! I hope everyone who attended enjoyed the day and found it valuable and will be returning to school with ideas to improve writing in class. The conference will also be delivered in Llandudno in June and Cornwall in July! For details please visit the Alan Peat Website. You may have noticed a plethora of 360 degree videos popping up on facebook and Youtube. These videos are recorded with a camera system that simultaneously records all 360 degrees of a scene. Viewers can pan and rotate a 360 video's perspective to watch it from different angles. I look the immersive element to these videos; being able to control what to focus on. I think they are also a great way to inspire writing in class. You can read about an example of this linked with Star Wars - Jedi Writing - Inspiring Writing Through Star Wars. The following link will give you all the information about the pack including some free resources such as a video to share with your class and a letter for parents. THE SATs PACK from @SparkyTeaching. Travel back in time with Virtual Reality! Virtual Reality is getting more and more popular. Having used Google Cardboard in the classroom for the past year, it never surprises me how immersed and engaged children can are when exploring different environments straight from the classroom. There are a variety of virtual reality apps available on the app store, plenty of which have a 2D option so the app can be viewed on an iPad if you don't have enough headsets and devices. A couple I have stumbled across have come from the brilliant team over at Computeam. There are plenty of ways in which this app can be used in the classroom, just allowing children to tinker, play and try to create their own song would be the first but looking at patterns, sequences and making links to computing skills.